One area of neglect by the US military is expeditionary fuel operations. Bulk fuel is over 70% of the logistical need for a modern army. Unfortunately, the US Army is accustomed to the Cold war base system where it simply draws fuel from nearby depots. The last major wars did not reveal the problem because that situation allowed direct access to fuel from Kuwait and Saudi Arabia. Expeditionary plans are to hook large hoses to tankers off-shore and pump fuel to large bladders ashore. This is very difficult, dangerous, and NEVER practiced in peacetime. Assuming that perfect weather and luck combine to allow this in wartime, it will conflict with the US Navy and Marine Corps' new "over-the-horizon" amphibious operations concept. The idea is that ships will avoid dangerous mines and shore batteries by off-loading 20 miles offshore. Running a hose 20 miles offshore is impossible but no one wants to address the fuel problem. A large fuel tanker near shore is a big target and so are hundreds of fuel bladders on a beach. Bulldozers are supposed to build berms to contain fuel spills but that is time consuming and dozers are large, costly items. As a result, this is rarely done, as this picture proves. A fuel farm must cover a huge area because bladders must be dispersed so that fires can be contained and they require a 24-hour firefighting team to stand by. The simple solution are double-hulled commercial "bunker barges," which are used at every major port to refuel ships as they off-load cargo. They have a low profile that makes them difficult to target and hit in combat areas if used to shuttle fuel from tankers offshore directly to fuel trucks. Since they would remain near shore until empty, the entire fuel farm problem is eliminated, as well as the need for hundreds of bulk fuel men, leak prone bladders, and bulldozers. The US military has difficulty keeping bladders in service since they only last a few years until they crack and leak from exposure to sunlight. Bunker Barges have none of these drawbacks and they can pump fuel through a mile of hose to roads and airfields far from the shoreline, and venture up inlets and rivers to deliver fuel to inland forces. They may be needed to support operations in undeveloped nations where harbors are too shallow for tankers to dock. A simple design modification can provide for a helicopter landing pad. This allows bunker barges to serve as a forward refueling point for helicopters. Attack helicopters and command helicopters would not have to fly several miles offshore to refuel, they could top-off at a bunker barge. In some operations, a bunker barge may move a hundred miles up a river or into a gulf deemed too dangerous or shallow for large ships. Ammunition may be loaded on the large deck to allow a bunker barge to function as a "Forward Arming and Refueling Point" for attack helicopters while the barge crews are augmented by specialists to rearm helicopters. Other Navy modifications may include radar-absorbing paint, a large fresh water storage tank, and .50 caliber machine guns to engage aircraft and small boats. Ideally, a small boat is attached to each bunker barge, like the Riverine Assault Craft used by the US Marines for several missions: 1) intercepting suspicious small craft approaching the barge; 2) moving hoses ashore; 3) shuttling personnel ashore; 4) sea rescue of downed pilots; 5) to serve as a lifeboat if the barge is sunk. Since bunker barges remain in the water, near artillery misses splash into the water, whereas it is easy to puncture a fuel bladder ashore. Moreover, a damaged barge discharges burning fuel safely into the water, whereas a broken and burning fuel bladder can unleash a wave of death and destruction ashore. 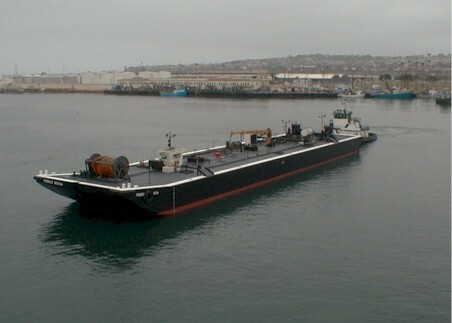 Military bunker barges would be a low-cost commercial off-the-shelf procurement, like the Shauna Kay (above), a 40,000-barrel double-hull oil barge launched August 23, 2000 at Zidell Shipyard in Portland, Oregon. Since they are slow ships not designed for rough weather, half should be based overseas. Bunker barges can operate during peacetime supporting US Navy ships, thus paying for themselves. During wartime they can move fuel directly from friendly refineries, like in the Persian Gulf, to combat troops ashore. Some situations may find them loading fuel from shore to refuel Navy ships offshore, especially in dangerous areas where using ports or local bunker barge operators may be hazardous; like the USS Cole incident in Yemen. Bunker barges are a simple method to fill a gap in expeditionary operations, which could also eliminate a few hundred bulk fuel positions in the US Marine Corps.